Quick starts and stops and lots of movements from side to side are the characteristics that make tennis challenging -- and stressful on your feet. Amateur and professional tennis players alike are prone to injuries of the foot and ankle, primarily from repeated lateral motions and quick stopping and starting. Clay and crushed stone courts help players slide better, and are considered the safest surfaces on which to play. Asphalt, concrete, rubberized, or carpeted courts don't allow sliding, and are not as healthy for your feet. 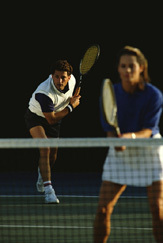 Common tennis injuries include ankle sprains, stress fractures, plantar fasciitis, and tennis toe. If you experience recurring or persistent pain, please contact our office for an evaluation. The best way to prevent foot injuries from tennis is to make sure you condition yourself. This includes building all-around body strength and flexibility; stretching the muscles (particularly in your calves) before, during and after play; drinking lots of water; and wearing the right shoes. Tennis shoes need lots of cushioning and shock absorption to deal with all the forces placed on your feet during play and to keep your foot and ankle stable. Be sure to choose shoes specifically for racquet sports; running shoes, for example, don't have the support needed for the side-to-side movements common to tennis. Look for a tennis shoes that have a reinforced toe, wiggle room in the toe box, padding at the ball of the foot, sturdy sides, a low, well-cushioned heel that is not flared, and a firm heel counter for support. Try on shoes with the socks you normally wear to make sure the fit is right. Go shopping at the end of the day when your feet are larger and fit your shoes to the larger of your two feet. Let your feet be your guide to fit. Choose only shoes that are comfortable in the store -- don't expect a wear-in period. The shoes should feel supportive, cushioned. and flexible, with some resistance in the heel for greater stability. Walk around the store in each pair you try on. Be sure to walk on a hard-surface, not just a carpeted floor. Emulate tennis play by jumping up and down in the shoes and making some fast turns to see how the shoes will really perform.